A sales forecast is an estimate of your sales for the forecast period. Forecasts are often based on historical data, retrieved form accounting systems. The problem with this is that past performance rarely can be relied on for future events. Sales forecasting should not be confused with sales pipeline management – tracking prospect responses to milestone stages within a sales process. 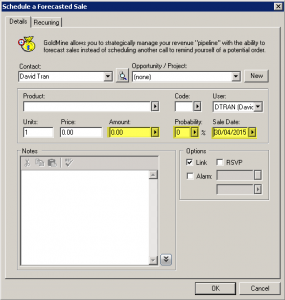 Sales forecasting is quite simply “how much revenue is expected next month?”. Introducing sales forecasting to an organisation can be met with suspicion from sales staff, “not more data entry, I haven’t the time!”. But it need not be this way. Efficient sales forecasting turns good sales people into great ones and allows for more autonomy, keeping sales staff more focused and hungry. The trick when starting is keeping it simple and tracking only the essential information required. Whether you use Excel, MYOB, or a CRM system sales forecasting is important as businesses to predict future cash flow and budgeting so if you send B2B quotes, this method will work for you. The value of the sale is easy – what’s the final value of the quote? The date of close is a belief of when the deal will fall. The percentage likelihood of close is simply a guess from the sales staff – a gut feeling. Don’t be tempted to try to over engineer these numbers with process management (simply use 10%, 20%, 30% etc through to 90%). Why no 0%? Because if there’s a 0% chance of close then mark the deal as lost and move on. Why no 100%? Because then you’ve won it! Mark it as a win, congrats! DO create reports on the monthly forecasts and review them regularly. The report should allow you to arrange by date, sale value or percentage close. DO keep in touch with prospects that plan to move months ahead. Stay top of mind and they may bring their timeline forward. DO have weekly meetings to compare closed/open sales for the month to ensure sales team members are meeting targets. DO adjust the date of close. Prospects change their mind and that’s okay, roll with the date changes but keep them current. DON’T allow sales dates to get out of date, there are no ‘past forecasted sales’. Either change the date to the future or mark it as a lost sales. Tagged: pipeline, Reporting, sales forecasting.